Reddit user codes a MIDI keyboard player for the Paris map. Footage of the "Piano AimBot" | Courtesy OverThought on Youtube. When Overwatch revealed a working piano on their new map, Paris, players immediately started getting creative. One fan has gone above and beyond to combine real-life musicality with code. Reddit user zbone created a script that allows him to play a song on a real MIDI keyboard and have it “translated” to the piano in Paris. 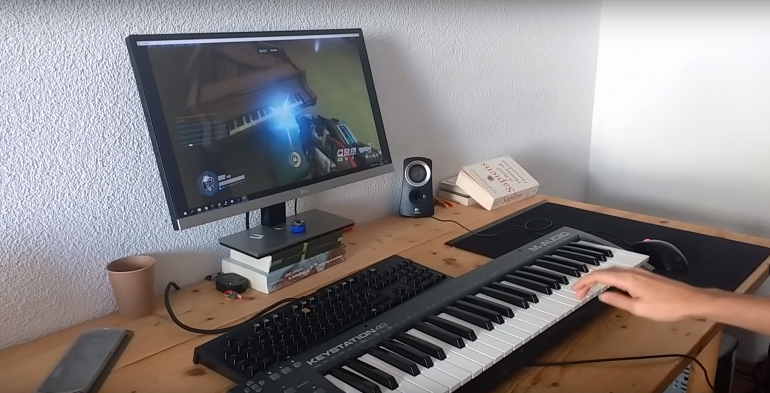 With each keystroke, Soldier: 76 “shoots” a key on the piano and the game plays the note. The script, written in Python, allows users to play “anything you want live on it” and also load MIDI files, according to one of zbone’s comments in the thread. If other players are interested in using this technology, zbone is willing to share the code. Video has already been uploaded of someone playing the French National Anthem using the “Piano AimBot” technology—very fitting for the Parisian map. Take care when using the code or creating another, however. While this is a fun, harmless use of “aimbot” technology, using any script within Overwatch is technically against the Terms of Service. Luckily, players can still rely on their own creativity to create music. Social media has been blissfully full of people playing tunes on the piano, such as this Bastion playing the Super Mario theme. The Paris map is still in the Public Test Realm (PTR), so there’s no chance of a team in competitive getting distracted trying to play Hot Cross Buns—yet.